Andhra region of south India also enriched from Jaina heritage and Jainism was also deep rooted in the region. 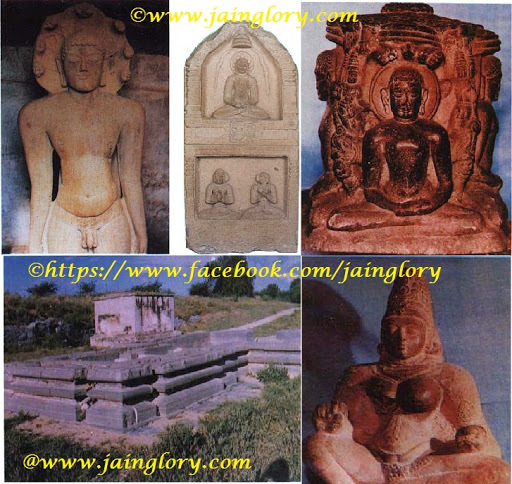 If we have a look on history then it is gleaned that Jainism has its presence since before Christ era because natural cave abodes of Jaina ascetics along with Brahmi inscriptions found in Andhra. Moreover, Jaina monuments, sculptures, cave temples are extensively found in Andhra region. The history of Jainism in this region is as glorious as Tamil and Kannada Jain history. The Andhra region was under sovereignty of Saatvahan, Nolambas, Early Chalukyas, Rashtrakootas , Later Chalukyas and Vijaynagar Empire. Jain temples of Andhra are generally hailed from 6th to 14th century AD. The time span is attributed to above said dynasties monarch. They contributed greatly to flourish Jainism under their patronization. Let us know about an ancient Jain pilgrimage center which breaks the notion that Jainism was not so popular in Andhra region and makes its concern to Rashtrakoota sovereigns. Danavulapadu :- Danavulapadu is situated in Jammalamadugu taluka of Cuddapah(Kadapa) district of Andhra Pradesh state. The village named Danavulapadu is a very small village and about 70 kilometers from district headquarter in north- west direction on the bank of river Pennar or Pinakini. The village is situated on the road connecting to Jammalamadugu and Proddutur. Ancient Jain temple remains of Danavulapadu :- The village Danavulapadu is one of the earliest Jain centre of Andhra Pradesh. The village is a deserted village now because it was buried in the sand dunes of river Pennar or Pinakini. On the left bank of river Pennar; the excavation was carried out by Superintendent of Archaeology, Madras Circle. The excavation carried in the year 1903 yielded Jina sculptures of Parshwantha, Mahaveer, Sarvatobhadra, Nishadhi Memorial slabs, water chute, Yakshini image and architectural pieces of ancient temples etc. Parshwanatha sculpture which is depicted in Kayotsarga posture has about 12 feet height. The temples of Danavulapadu comprise of two basement type structure and temple has garbhagriha, Antrala and square manadapa structure. The temple excavated is a perfect specimen of Rashtrakoota art. There were about 12 inscription found during excavation which were inscribed on pedestal of images and sarvatobhadra sculpture’s faces. These inscriptions were from 8th century onwards. On the basis of bricks found from this temple site it was concluded that the temple structure should be old enough and should be hailed from Rashtrakoota era. Extensive sculptures, chaumukha and Nishdhi Memorial slabs excavated from this site have been shifted to Government Museum, Chennai where they displayed for enthusiasts. History of Danavulapadu :- Danavulapadu village had its original name as Kurumarri and it is evident from “Jammalamaduga kaifiyat”. The name Danavulapadu has meaning “A ruined settlement of demons” in telugu language. The settlement of Demons was said because here a mass population of Jain followers was residing here and they were non vedic. Therefore they were attributed as demons and village got its present name by later hindus. The excavation at danavulapadu rendered many great piece of information regarding ancient history and construction time of the temple. An inscription which is inscribed on a Sarvatobhadra sculpture provides information about Sri Vijaya ;a chieftain of Rashtrakootas. He is eulogized in the inscription as sarvavikramatunga, Anupamakavi and Arivingoja. Chieftain Sri Vijay who was also known as Dandnayaka was addressed in the inscription and wished to be lived long under reign and patronization of Indra(Narendra). On the basis of paleographic and inscriptional evidences, it is concluded that the Indra is none other than Indra III who had title of Nithyavarsha. Although Kotthiga had the same title but Sri Vijay inscriptions should be hailed from Indra III who reigned from 916 to 928 AD. The inscription has further information that Sri Vijay adopted Jain ascetic’s life in later life and vow of Sallekhana to get Samadhi Maran. The inscription was written by Sri Vijay’s Clerk named as “Gunavarma”. Gunavarma has not been identified yet from inscriptional and literary sources.